Danny Ocean isn’t really a fictional character, he is Frank Sinatra. You better believe his boys would do anything for him. Except Dean, he was the only one who ever said no to old blue eyes. Frank really dug Dean’s truthfulness. 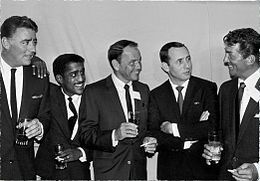 And, over 50 years later, Frank Sinatra, Dean Martin, and Sammy Davis, Jr. are still the coolest guys to ever hit the Vegas Strip! This entry was posted in Actors, Actresses, Classic Films, Comedy, Film History, Musicals and tagged 60's, Angie Dickinson, Dean Martin, Frank Sinatra, Jr., Jr. Humphrey Bogart, Las Vegas, New Year's Eve, Ocean's 11, Peter Lawford, Rat Pack, Sammy Davis. Bookmark the permalink. The coolest guys to ever walk this earth. I think it’s safe to say, we’ll never see their like again. Enjoy your movie evening! I agree, they were one of a kind. Enjoy your evening as well. Happy New Year!